Home » » Blog » Uncategorized » Wild Weekend at Inavale! Boy were there some ups and downs at our last event! 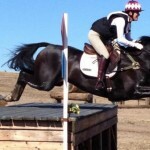 Next Phase Eventing brought down seven horses and riders for the Inavale Farms Horse Trials and started the weekend on a fabulous note. 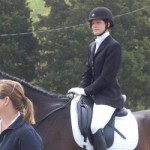 Three of our riders ended dressage day in first place. Lauren Plog on Money Talks scored a 21, Hannah McNamara on Dublin scored a 26, and Emily Lantz on Ivy also scored a 26. Huge improvements for all of these riders. 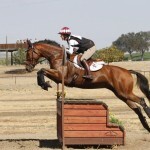 The rest of the crew made a very respectable showing and we were pumped for the XC phase. Beginning Novice and Novice went on Friday and all of our riders had clear rounds! 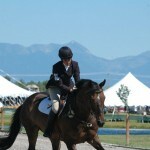 The horses were phenomenal and the riders looked beautiful, however we had a couple brain farts. 🙂 I think all the riders will be walking the Whidbey course a few more times to make sure they remember which jumps are theirs and where exactly the finish flags are! Silly girls. There were a couple big disappointments, but ultimately we were proud of their riding. Emily and Lauren had picture perfect rounds and were feeling wonderful about their mounts. On Saturday morning, Maris and I were awaken in the trailer to the sound of horses running. We thought it was simply the common occurrence of some loose horses taking a tour of the show grounds, so went outside to help catch them. Pretty quickly, Maris noticed that one of the horses was a stallion and the other horse was Lauren Plog’s Money Talks (Cash). The stallion was chasing, mounting, and biting poor Cash and it was extremely difficult to get him focused on anything else. After a good 20 minutes of efforts we were able to get Cash away from the stallion and back to his stall. The vet was called and Cash was treated that morning. He seems to be getting better each day but we are giving him some time off before we fully evaluate his soundness. This of course, was devastating for all of us, but we are hoping Cash will be back to work soon and ready to eat up that XC course again. After that horrific occurrence we all were a bit shaken up but their were of course some positive points of the weekend. Helium Risin’ (Jo) and I had a super weekend. We had a bold XC go and a clean show jump, landing us in 3rd place in the Open Preliminary. I was thrilled with his efforts and feel more and more lucky to have the ride on him. Emily Lantz pulled out the blue on Pink Ivy, which she was beyond thrilled about. Emily has worded incredibly hard with this hot and opinionated mare so she definitely deserves to be reaping the rewards. Joely Hannan ended 7th on O’Donnells Irish Charm and was very pleased with all three rounds of the event. After getting the trailer stuck in the mud and needing the assistance of two tractors to get pulled out, I think we were all ready to go home. I’m sure we will make it back to Inavale next year, but will hope for a bit better luck!!! Stay tuned for the report after Whidbey.